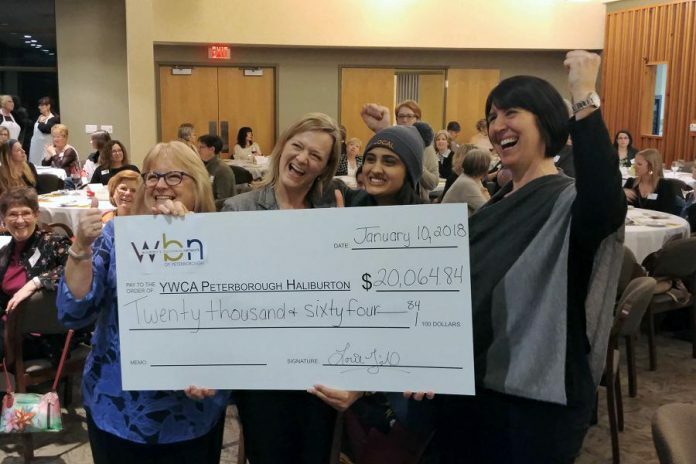 For the 2018-19 season of the Women’s Business Network of Peterborough (WBN), the organization is presenting a new platform for members to meaningfully give back to the community, as part of this year’s “Better Together” theme. 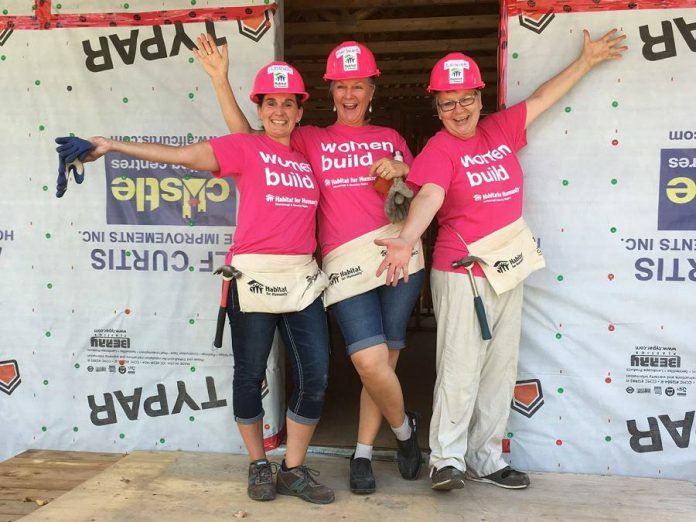 Carrying WBN’s legacy of community engagement forward, president Tracey Ormond says it’s important for the organization to nourish existing relationships with community-based organizations, while developing new partnerships with others, to accomplish far more than what might be possible working alone. WBN has contributed to charitable causes in Peterborough and the Kawarthas since 1961. The membership has placed personal emphasis on supporting the YWCA Peterborough Haliburton’s Crossroads Shelter, which supports local women and children fleeing violence who are in crisis. Since 2005, members have raised over $296,017 in total for Crossroads through their annual fundraising gala and 50/50 draws, with a recent emphasis on YWCA’s nutritional well-being program that provides healthy food, supplements, and vitamins to women and their children 365 days a year. WBN members have also supported other organizations, including Habitat for Humanity’s Women Build thta sheds light on the nation’s affordable housing crisis, Pulling for Dementia Fire Truck Pull in aid of the Alzheimer’s Society, the Under the Lock sledge hockey tournament to support the Kawartha Blazers, and the Peterborough Dragon Boat Festival in support of breast cancer care. What happens to the surplus food left after a WBN meeting? That was one question that plagued Tracey last fall. 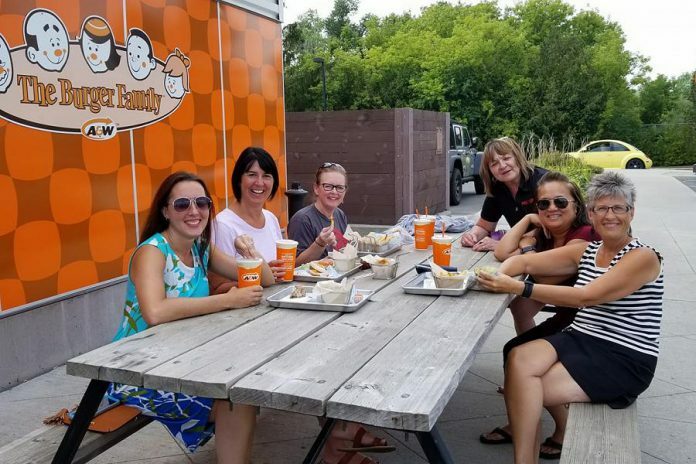 As WBN’s membership director at the time, she found it disheartening to see the abundance of food going to waste after each member meeting — a result of last-minute cancellations by members who had already paid for their meal. 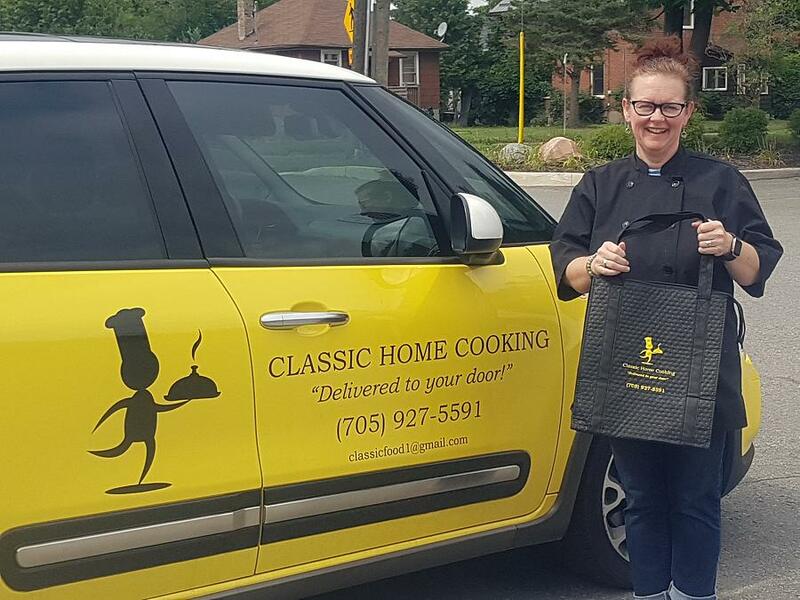 Inspired by the Rotary Club of Peterborough donating food from their meetings and having heard how badly some organizations need the food, Tracey devised a plan to keep good food out of the garbage and help it into the mouths of the hungry. Since last September, it’s a routine that now happens the first Wednesday of each month at WBN: surplus food from buffet-style or plated dinners get packed up by Tracey and a handful of volunteers immediately after the meeting and delivered to local organizations that feed hungry people looking for food that evening, including the YES Shelter for Youth and Families, The Warming Room, One Roof Community Centre, and the YWCA. Tracey gives an example of what happened when there was a winter storm on the night of a WBN member meeting. Because of poor road conditions, many members and guests cancelled at the last minute — leaving a lot of prepared food potentially going to waste. Sarah Fleming, One Roof Program Coordinator at Warming Room Community Ministries, says food donations allow the ministry to continue living out their mission of feeding those who are hungry within Peterborough. One Roof Community Centre, an outreach program of Warming Room Ministries, is open 365 days a year and serves on average 300 meals a day between lunch and dinner. “Food is always needed at One Roof. Due to our increase in numbers, we are always finding more ways to involve the greater community of Peterborough to help those in need of food,” adds Fleming. One Roof also offers professional training, life skills, community building, harm reduction, access to primary health care as well as a safe space to be. Fleming says collaborating with community-based organizations to create a united front that helps to empower individuals to make change is one of the Warming Room’s core values. If you are interested in making a food or fund donation to Warming Room Community Ministries, please visit warmingroom.ca/donate or call 705-874-1812. If you’ve got blood to give, the WBN will want to see you this fall. WBN has teamed up with Canadian Blood Services and joined the Partners for Life program as a Pledge Partner. For the 2018-19 season, the women’s organization will organize a number of blood donation drives in response to the urgent need for blood donors across Canada. The partnership comes after an announcement last month from Canadian Blood Services, saying more than 22,000 donors across Canada were needed before the Labour Day weekend at the end of August. “Hosting a blood drive fits with WBN’s core values of giving back to the community,” Tracey says. “With a simple blood donation, we have the ability to help save the life of someone who could be a fellow member, colleague, or loved one. I am urging WBN members and their families to donate blood and help ensure that patients in our local hospital have a supply of blood ready and waiting before an emergency occurs. Debbi Barfoot, Canadian Blood Services Territory Manager, says there is power in numbers. “When an organization, business, or leader gets involved with their local community clinic to help raise awareness, book a group to donate as a team or to adopt a clinic, the donation collection increases,” she says. WBN is also planning to adopt the Peterborough Blood Donor Clinic during a week in the New Year. The purpose of adopting a clinic is to raise community awareness, personalize the donation experience by decorating the clinic, have a volunteer greet donors and provide additional refreshments. Given its short shelf life, the need for blood is constant. Cancer patients, accident victims and people with blood disorders rely on blood transfusions every day. According to Canadian Blood Services, in 2018 about 100,000 new blood donors will be needed to give life, replace the aging donor base and maintain the national blood supply. Currently, the donor collection target in Peterborough is at 82.7 per cent for the calendar year. 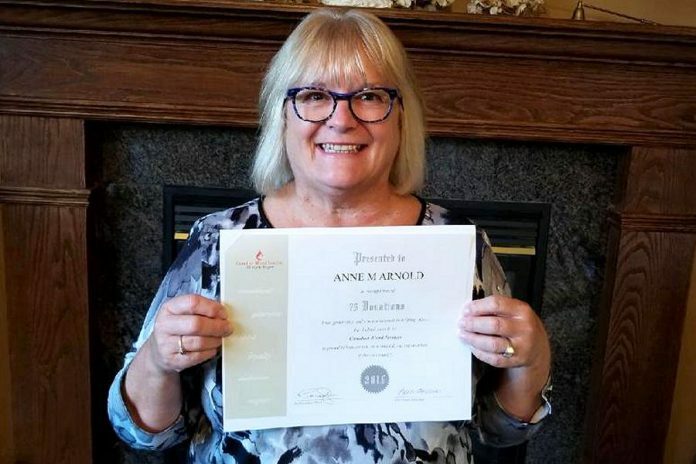 Debbi says this indicates that the Peterborough Blood Donor Clinic not only needs a large increase of new donors to support their collection target, but they also require past donors to come into the clinic and donate. Donors of all blood types are needed, especially those with types O negative, B negative and A negative. According to the Canadian Red Cross, type O negative is the universal blood type that can be safely transfused to anyone, and is often used to treat trauma patients. Citizens can take part by making an appointment or by walk-in at the Peterborough Blood Donor Clinic on 55 George Street North. For more info about adopting a clinic near you, visit www.blood.ca/partnersforlife. By adopting a clinic, organizations can make a difference in the lives of hospital patients. Choose a clinic date and recruit donors from within your organization, your networks, customers and community, and help give life to those in need. Canadian Blood Services will work with interested organizations to plan and support their involvement. For more information about WBN and how to become a member, visit www.womensbusinessnetwork.net.